Sadio Mane is fully fit, and he’ll be ready for the weekend’s tie with Leicester! What marvellous Monday afternoon news. There had been suggestions, quite strong in many circumstances, that our summer signing had limped off for Senegal versus Namibia in his country’s AFCON qualifier at the weekend, but the reliable Chris Bascombe has thankfully confirmed in the Telegraph that Mane is not injured. His substitution was entirely precautionary, and Liverpool fans, management and players can relax. 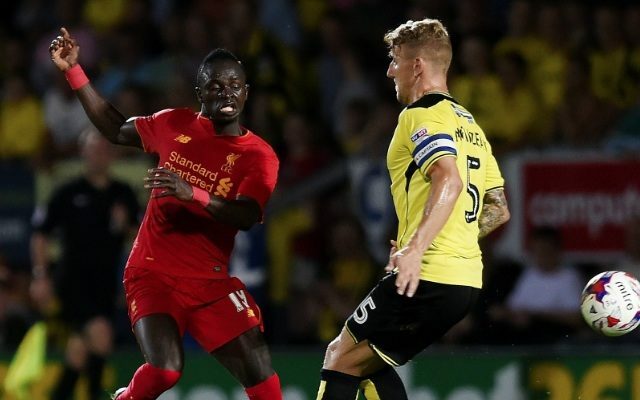 In fact, according to Bascombe, Mane reported to training this morning and joined in as usual, suggesting he hasn’t even suffered a knock. Even better. The flyer will now surely start on the right wing for Liverpool versus Leicester on Saturday lunchtime, our first game in front of the New Main Stand. This is tremendously exciting, and it’ll actually be Mane’s first game at Anfield since his red-card last season with Southampton! Let’s hope he fares a little better this time against the Premier League champions.